1) Take a plain piece of paper (any size - but it must be square). Draw two LARGE dots anywhere on the paper. 2) Now, draw ten smaller dots around the paper. 3) Now, choose one of those small dots, and draw straight lines from it to BOTH of the larger dots. 4) Repeat for another of the small dots - join it with straight lines to the two large dots. 5) Repeat for all of the other small dots. Do not join any small dots together, and do not join the two large dots together - just join the small dots to the large dots. 6) Now, you can colour them. You could try to colour it using two colours, so that colours do not touch each other, or using shades of the same colour (with darker shades on the outside, and getting lighter as you go in). Experiment with the positioning of all of the dots. What does the picture look like when you put both large dots together in a corner? 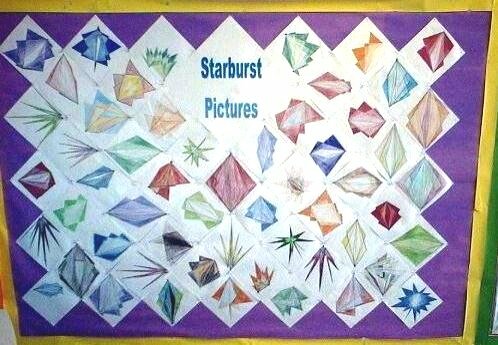 9) When I made this display with a class, I gave a Starburst sweet to each child as a reward for helping to make the display! Another display based on this idea can be found here. The children then transfer this to an IT application - we used Colour Magic - no special tools needed for this though. To complete the picture successfully requires selecting different brush sizes, the line tool, the fill tool, printing (of course!) - and with the same limits on colours and where they can be placed, the planning element is still there. The skill of click & drag is also there, and if not done accurately, the filling in of colours can result in some interesting and valuable lessons on how to put things right. I have found that this has developed as a favourite activity for wet play when the children enjoy making really complicated designs and weird & wonderful shapes. i am an art teacher for elementary students. I am trying this lesson plan tomorrow (can't wait) because I know the kids are going ot love this and also find out more about the greatness of the Line.....Thanks. I have just done this with my Y3 class and they look amazing! Thank you. This is perfect for my year 3/4 class at the start of term. Our topic is Reach for the Star and I wanted a Maths activity that was related! A very easy technique which lets you make 2D pictures look 3D. Follow these simple instructions to make a beautiful diamond display in your classroom. A fantastic display for the start of the year, requiring careful use of pencil and ruler! A display that was created using the Starburst technique shown here.